For years I’ve wanted to start scanning in all the photos of my yout’, sorting them out, and putting them in photo albums. I have also wanted to actually PRINT OUT digital photos so I could put them into albums. Today I have begun The Great Photo Archive Project. If I’m lucky, it won’t take me the rest of my life. I think I have a similar photo in a paint-spattered shirt and dangly earrings. So. Very. 80s. Wow, pers1stence kind of looks like ellenmillion in that photo. I think it's all the hair. 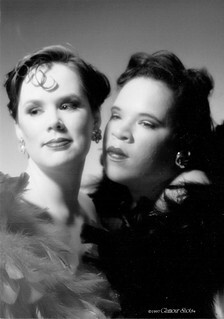 Glamor photos! OMG, did we all have them done? I think you all look lovely in all of those. Ehehe. 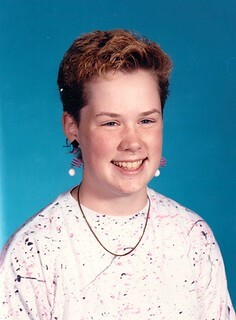 One more for paint-splatter clothing and dangly earrings and much hair gel. So what year did people stop wearing exactly the same thing? 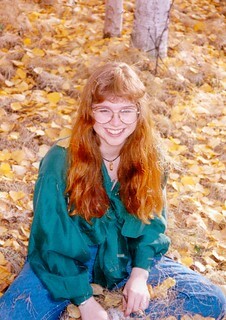 1992 or thereabouts?